9.3.2014. 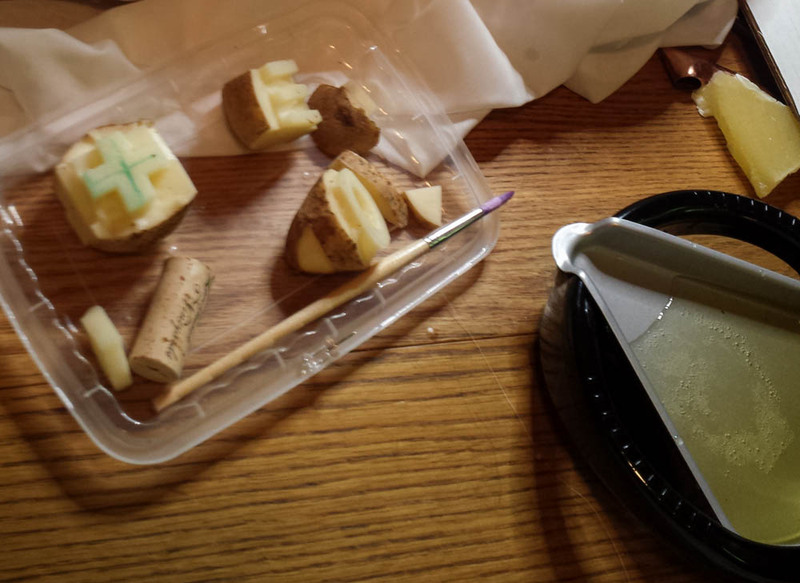 Ever since my first session with wax-resist pattern-making (see 7.27.2014), I've wanted to get back to it. But, as with so many things, I have to stalk it, circle around my prey till I'm ready to pounce. This time I wanted a real project, not mere doodles. Another scarf? I ordered some silky cotton voile from DharmaTrading. I wanted material that draped nicely but with a dense enough weave to easily release the wax. 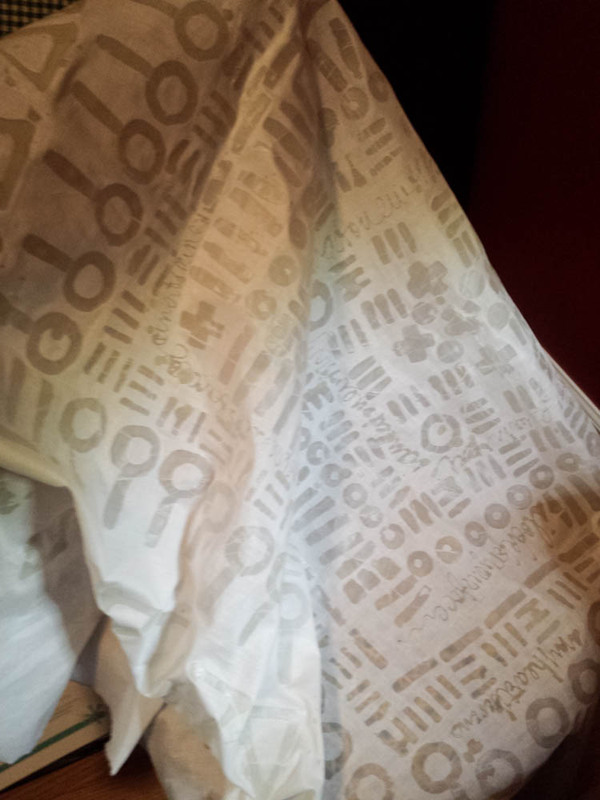 When the 52" fabric arrived, I ripped a piece 52" long, for a square. I started in the center because who knew how my "style" might change over the course of stamping and dripping. Below is the result of three sessions. I began listening to Rumi poetry as I worked. It helped me work quickly (in a happy trance) and gave me some words to drizzle. After the wax was applied, I stuck the cloth into the freezer briefly, then crumpled it to get the wax to crack. 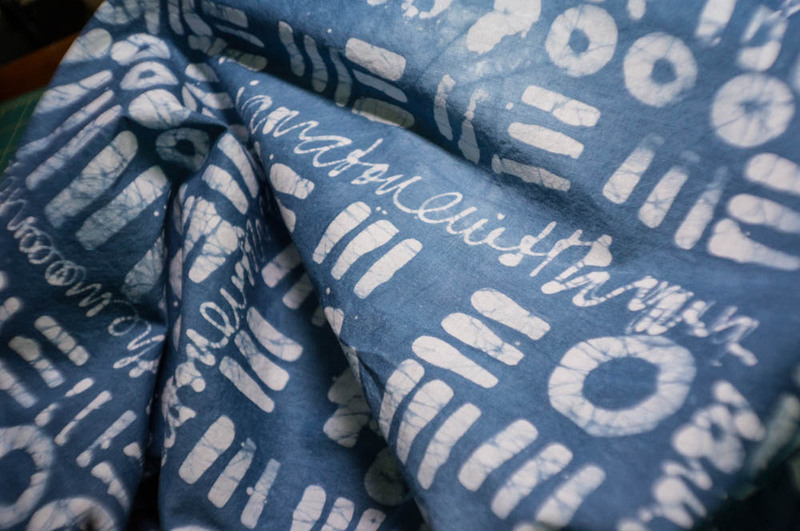 That "vein-y" effect is kind of the hallmark of batik (or how Americans perceive it, anyway). 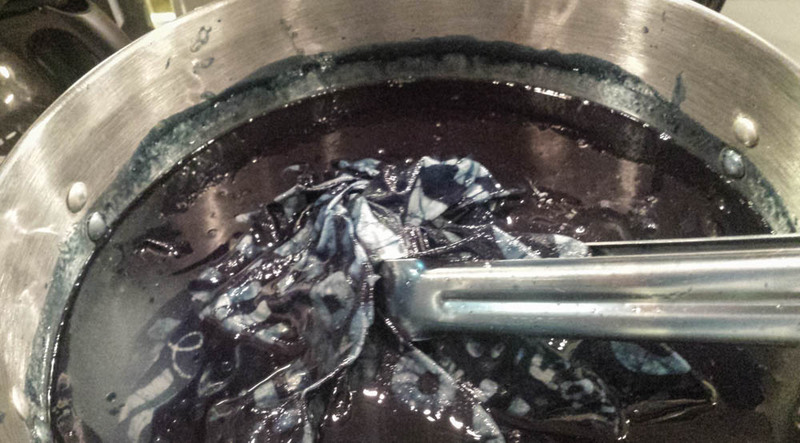 Next... into the indigo dye vat. (Jim joined in the project at this point.) 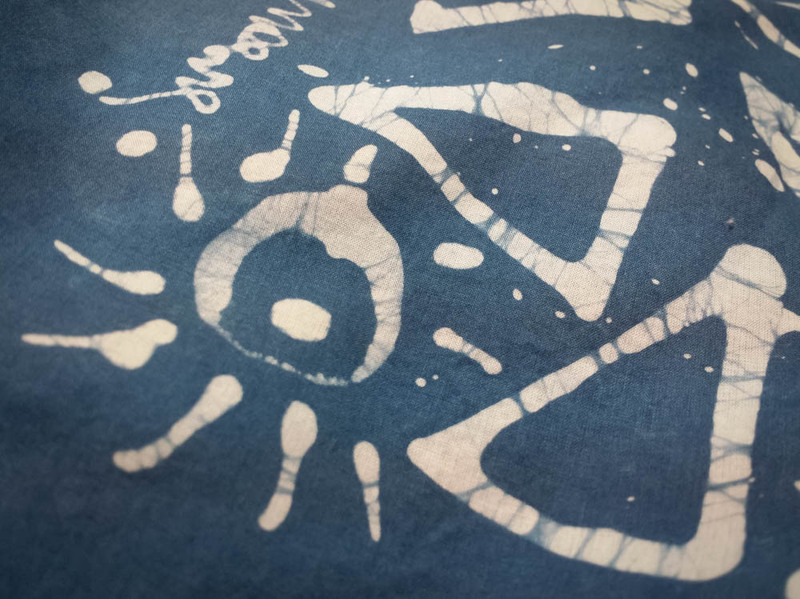 When we took the fabric out of the dye (photo below), I could see immediately that my design could have benefitted by some guidelines drawn on the fabric. You can see on the right where my stamping went a little haywire when I got tired. Sometimes "spontaneity" can be assisted with better prep. These projects all become learning journals in the long run. Now for the messy step: boiling off all that wax. Last time this step was an endless nightmare of boiling a rinsing and some of the fabric from that misadventure is still stiff with wax residue. But I've been studying. I got a bigger pot -- 3-1/2 gallon stockpot -- so that the melted wax would have room to float off the cloth and up to the surface. And I added a little castile soap. It was a witch's brew (see below). I stirred the cloth to encourage the wax out of all the nooks and crannies. When the big mess reached the boiling point, we turned off the heat. In our cleverness, we decided to drop a plate on the fabric to keep it well beneath the surface. That splashed hot blue wax all over the place -- stove, floor, us. Damn, we thought we had the whole thing figured out. Anyway, now all we had to do was let it cool, then skim the hard wax off the top, like cold fat off the au jus. We discovered that 3 gallons of waxy water takes all frickin' night to cool. But then... new day! Wax discarded! 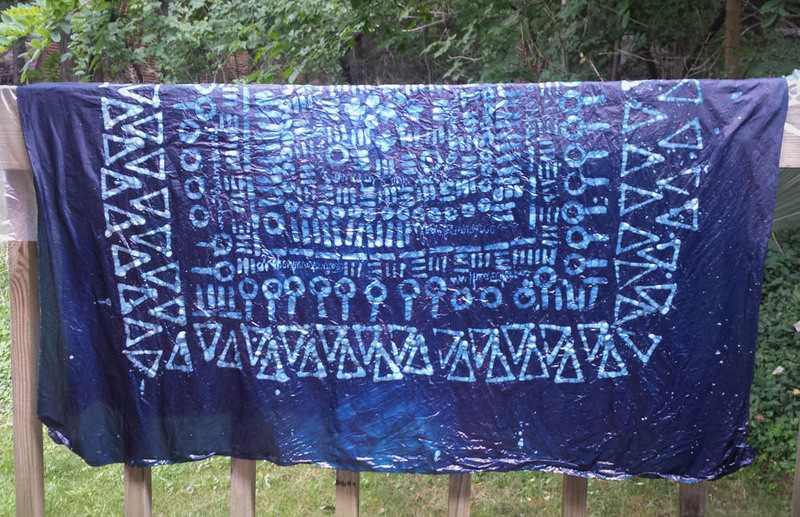 Fabric to washer -- cold water and blue Dawn. Then again in hot water and blue Dawn. And oh, my fabric was so soft! Not a lick of wax left! Onward. I thought I would fringe the edges but... life is too short. So I did a neat little hand-stitched hem. Done!